How much will U.S. women's national team miss Megan Rapinoe and Lauren Holiday? What Does USWNT Lose Without Megan Rapinoe And Lauren Holiday? Megan Rapinoe and Lauren Holiday will both miss the U.S. women's World Cup quarterfinal match against China on Friday after picking up their second yellow cards of the tournament during the Americans' 2-0 win Monday against Colombia. Holiday is one of six players on the U.S. team to play every minute so far in this World Cup, and Rapinoe, the team's leading goal scorer, has played 325 of a possible 360 minutes. 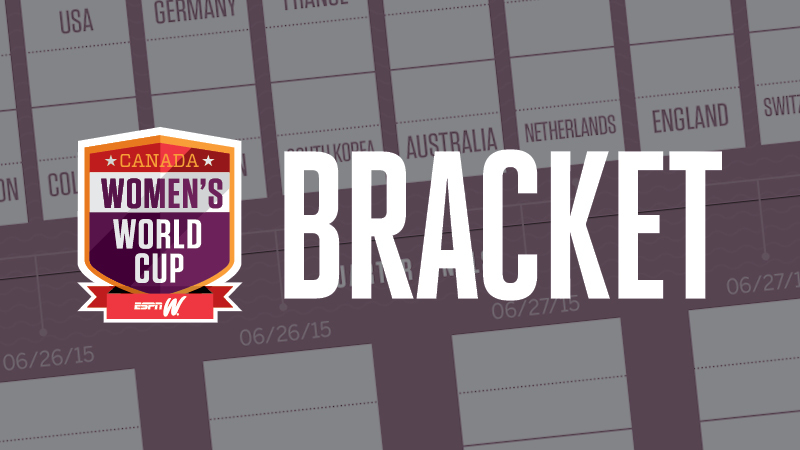 What will the U.S. miss without Rapinoe and Holiday? • Rapinoe (10 chances) and Holiday (eight) each have created more chances (passes that led to shots) than any other player on the U.S. women's national team in this World Cup. • In fact, their 18 combined chances created are one fewer than the rest of the team combined. • Holiday (293) and Rapinoe (258) each have more touches than any other player on the U.S. team. 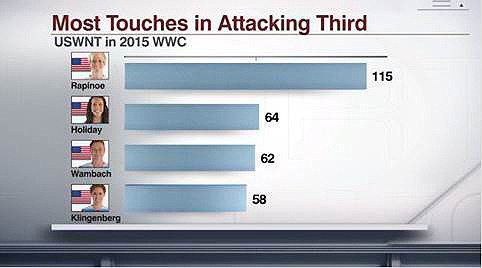 • In the attacking third, Rapinoe's 115 touches are almost twice as many as any other player on the U.S. roster. Holiday ranks second with 64 touches in the attacking third. • Rapinoe also has taken opponents on one-on-one 12 times at this WWC, twice as many times as any other U.S. player. 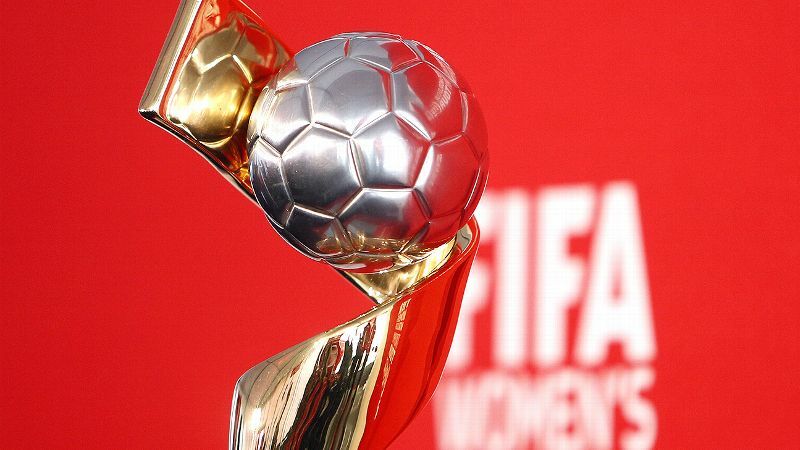 • Holiday and Rapinoe each have more than 100 caps for the U.S. women's national team; two of their likely replacements -- 22-year-old Morgan Brian and 26-year-old Christen Press -- have fewer than 50 caps apiece and are making their Women's World Cup debuts. The four players' World Cup minutes, followed by international caps, are shown below. She said it: U.S. midfielder Tobin Heath on losing Rapinoe and Holiday: "I think [Holiday's] an unsung hero on our team. Her work ethic and just her ability and her vision on the field is tremendous. I don't think she gets enough credit for what she does for this team and her leadership qualities. ... And obviously Pinoe has been one of our stars this tournament so far in her ability to create and be dangerous." Paul Carr, M.C. Barrett, Jon Costa and Sharon Katz contributed to this report. Can Press help fill Rapinoe's absence for U.S. women? 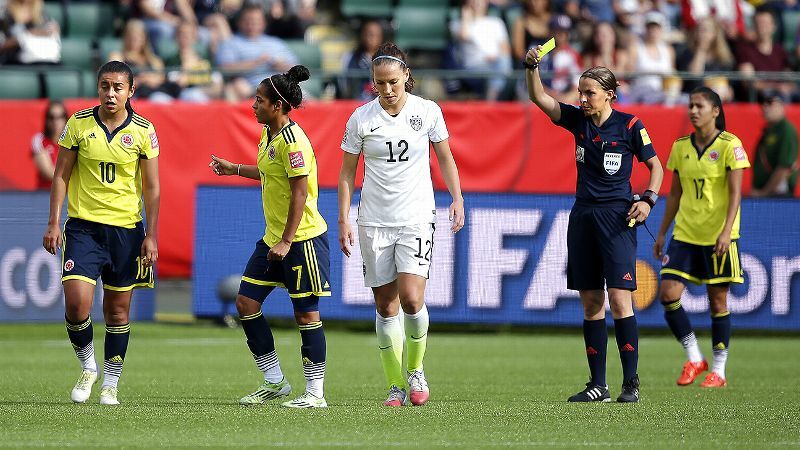 Wambach debates costly yellow cards for U.S.